7 Kids and Us: Disney Infinity Starter Pack for WII $49.99! 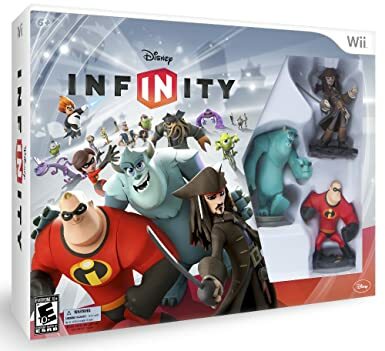 Disney Infinity Starter Pack for WII $49.99! This Disney Infirinty Starter Pack for Wii is just $49.99 + free super saver shipping! Also includes base piece that allows access to 3 INFINITY Charaters: Monsters University, Pirates of the Caribbean, and The Incredibles AND 3 INFINITY Characters: Mr. Incredible, Jack Sparrow, and Sulley. LeapFrog Touch Magic Ocean Music School $10.99! Roku HD Streaming Player $39.99 SHIPPED! Fisher-Price Imaginext Batman Gotham Jail $14.85! VTech Go! Go! Smart Wheels Garage $22.49!! VTech 2-in-1 Shop and Cook Playset $29.99! Seat Pets Dog, Cat and Monkey just $10.49 each! LEGO Friends Olivia's House $52.49! Get a Personalized Holiday Ornament for just $3! Fuddruckers New Turkey Burger "Autumn in a Bun"
It's All About Her Holiday Giveaway! Hobby Lobby $50 Gift Card Giveaway! 2 Winners! Tyrneathem Holiday Gift Guide Giveaway! Jellyfish Art- Jellyfish Tanks Make Great Gifts! Get a Dirt Devil 3-in-1 Stick Vac for $19.99! Great Deal on 6 Glass Pie Pans for under $6! Earn Christmas Cash with Gazelle!